Graphene « Global Market Insights, Inc.
Of late, Graphene Market has been gaining remarkable traction, owing to the extensive use of graphene for power storage and composites. The scientific community has been researching on the viability of graphene for aerospace applications in a strategic collaboration with the European Space Agency (ESA), with an aim to test the potential of graphene in zero gravity conditions. The success of this research is slated to create new avenues for the players in graphene industry. As per statistics, graphene market held a revenue of USD 20 million in 2016. Analyzing the ongoing and future trends of graphene market, Graphenea has decided to expand their graphene oxide (GO) pilot plant with a production capacity of 1 ton per annum. They are also working on the customization of GO to integrate it into different polymer ranges. This strategy will help the company move forward toward the production of graphene based composite materials, strengthening its position in graphene market. 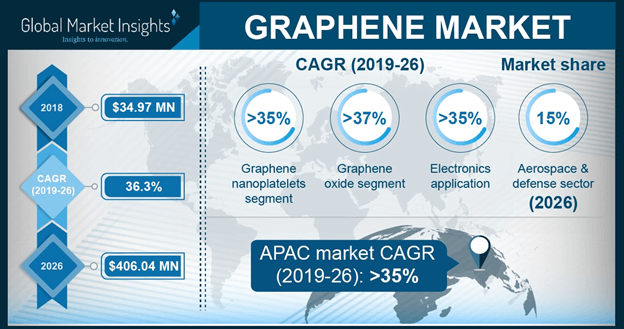 On these grounds, it would be noteworthy to mention that graphene market from graphene oxide is slated to cover 40% of the overall share by 2024, and will grow at a CAGR of more than 35% over 2017-2024. Major participants in graphene industry are Graphenea, Grafoid Inc., Applied Graphene Material, Graphene Frontiers, LLC, XG Sciences, Inc., Advanced Graphene Products, Angstron Materials, Inc., AMO Gmbh, ACS Materials LLC, Xiamen Knano Graphene Tech. Corporation Ltd., Applied Nanotech, Inc., Thomas Swan & Company Ltd., Nanjing XFNANO Materials Tech Co., Ltd., Haydale Limited, and Graphene Laboratories, Inc.
Apart from being utilized in composite materials, graphene finds application in healthcare sector. Graphene oxide is extensively used in various dental care products, owing to its capability to resist antimicrobial agents. Growing awareness among people about their dental health will influence graphene market share noticeably. As per a market study, graphene market from healthcare sector will exceed a revenue collection of USD 20 million by 2024, owing to the requirement of the product for tissue engineering, drug delivery systems, and cancer treatment. Diabetes monitoring and therapy involves the utilization of wearable and handy graphene based electrochemical devices. These devices are apparently painless, non-invasive, and offer stress-free monitoring, which helps diabetic patients to avoid expensive, lengthy, and painful diabetic therapies. Increasing prevalence of diabetic patients across the globe is slated to fuel the product demand, due to cost effectiveness. In addition to this, for next generation cancer therapies, researchers are planning to undertake extensive studies on graphene based medicines to detect the effectiveness of the therapy on cancer cells. Automakers have been giving preference to graphene material for manufacturing luxurious cars, owing to the fact that the usage of graphene decreases the overall vehicle weight. Graphene itself is lightweight as compared to the other materials, and its utilization will improve the fuel efficiency and speed of the car enormously. Recently at the Auto show held at Geneva, Pininfarina has unveiled electric car operated with graphene based battery. On that note, automotive sector covered 20% of graphene industry share in 2016 and will register a CAGR of more than 34% over the coming seven years. Pertaining to quicker charging time and longer driving ranges, graphene battery is expected to witness huge demand for the automotive application in the future. The rapid growth of Graphene Battery Market stands as a testimony to the development of graphene industry, which, according to Global Market Insights, Inc., will record an annual growth rate of 35% over 2017-2024. This entry was posted in Bulk & Specialty Chemicals and tagged Aerospace & Defense, Automotive, Electronics, ENERGY, Graphene, Graphene Market, Graphene Market Analysis, Graphene Market Forecast, Graphene Market Growth, Graphene Market Outlook, Graphene Market PDF, Graphene Market Report, Graphene Market Share, Graphene Market Size, Graphene Market Trends, Graphene Market Update, Graphene Nanoplatelets, Graphene Oxide, Healthcare, Mono-layer & Bi-layer Graphene. The growing trends of portable electronic devices and increasing electric vehicle demand will proliferate the graphene battery market growth in the coming years. According to Global Market Insights, Inc. “Graphene battery market size is estimated to witness a CAGR of 20% over the period of 2016-2024.” Graphene products are regarded as low emission versions and hence are being widely adopted to promote a green environment. Moreover, its advantages such as effectiveness in high temperatures, increased charge cycles, quick charging capacity, and extended charge holding capacity will enhance the graphene battery industry outlook over the coming years. Stringent regulatory norms to curb emissions and carbon footprint have positively influenced the graphene battery industry share. Batteries constitutes of lead and cadmium which releases pollutants in the environment. In this regard, in 2008, the U.S. EPA established the National Emission Standard for Hazardous Air Pollutants (NESHAP) to regulate the emissions during the battery manufacturing process. Furthermore, implementation of these strict norms to limit automobile emissions will also boost hybrid and electric vehicles demand. Graphene battery is one of the fastest energy storing solutions available, globally. Moreover, graphene has higher heat resistance with improved recharging efficiency making them a safer option for electric vehicles. Graphene is poised to change the future of batteries with 10x faster charging and making it more reliable, efficient, and strong. Based on technology, the graphene battery market is segmented into Lithium Ion, Lead Acid, Lithium Sulfur, and Supercapacitors. Supercapacitors are overtaking the market due to its superior charging abilities and greater shelf life. Moreover, mobile manufactures are also widely adopting the supercapacitors for increasing operating battery life, which in turn is fueling the supercapacitors graphene battery industry share. The beneficial properties of graphene are making it a promising material for a multitude of applications. The versatile use of graphene batteries in Automotive, Aerospace & Defense, Healthcare, Electronics, and Industrial Robotics industries has generated significant growth opportunities in graphene battery market. Aerospace & defense applications are likely to observe considerable growth with increased defense expenditure in developed nations. Below are the key insights in terms of technology, applications, and regions pertaining to the global graphene battery industry trends. Graphene battery industry share from supercapacitors is anticipated to register a CAGR of 25% over the period of 2016-2024. Lithium ion battery segment worth USD 9 million in 2015, is projected to witness a significant growth, owing to its increasing adoption in healthcare and automobiles industry. UK is foreseen to witness a booming growth at over 20% over 2016-2024. 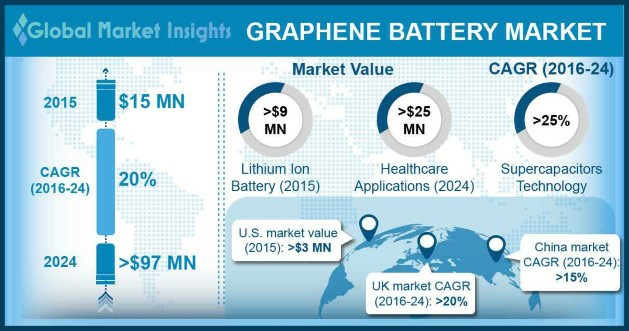 Graphene battery industry share in healthcare sector is estimated to exceed USD 25 million by 2024. The business growth is favored by increasing emphasis on portable medical devices. Industrial robotics application will witness an annual growth rate of 10% over 2016-2024. Japan graphene battery market size is predicted to grow at over 25% over the period of 2016-2024. The growth can be attributed to increasing adoption of electric vehicles for public transport. Taking into consideration the regional outlook, Asia Pacific market is set to grow significantly, subjected to heavy gains from Japan and China graphene battery market. China will observe considerable boost in manufacturing and production capacity, surpassing 2000 tons of graphene annually from 2016. Favorable government initiatives and introduction of strict regulations on the use of bio-hazardous batteries will bring positive impact on the growth of global graphene battery market. Increasing adoption of electric vehicles in the U.S. will drive the North America graphene battery industry revenue. Norway graphene battery market share will witness heavy gains as more than 20% of automobiles in Norway are hybrid or electric vehicles. The notable industry players of graphene battery market worldwide are Cabot Corporation, XG Sciences, Inc., SiNode Systems, Inc., NanoXplore Group Inc., Graphenano, Graphene NonoChem, Graphene 3D Lab, Cambridge Nanosystems, etc. Cost-effective products and shorter delivery lead time will be the key business strategies adopted by the market participants over the coming years. This entry was posted in Sustainable & Smart Technologies and tagged Energy Storage, Global Graphene Battery Market, Graphene, Graphene Batteries, Graphene Battery, Graphene Battery Industry Analysis, Graphene Battery Market, Graphene Battery Market Share, Graphene Battery Market Size, Graphene Battery Tesla, Graphene Car Battery, Lead Acid, Li-ion Batteries, Lithium Ion, Lithium Sulfur, Supercapacitors.